A new milestone for SILAC Industrie. The technical felts & nonwovens producer near Angoulême has purchased its first non-nuclear inline measurement system from Hammer-IMS. The M-Ray technology of the Marveloc 602-CURTAIN system is an alternative to conventional radioactive and nuclear measurement technologies. Now SILAC Industrie can measure the basis-weight of felts & nonwovens without requiring emission-related licenses, training, protection, radioactive safety, etc. The beating heart of the installation is the Marveloc 602, a measuring device realizing measurement precisions down to 1 gsm. 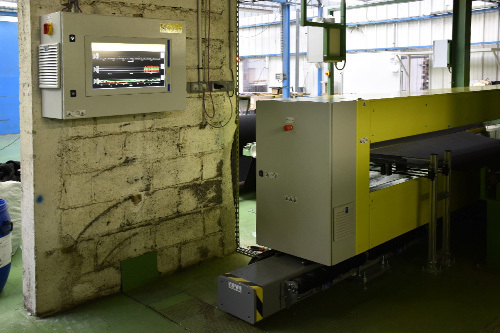 The Marveloc 602 is integrated in our four-headed scanning machine, the CURTAIN, of which the dimensions are tailored to handle the widths of the materials that SILAC produces. SILAC Industrie values the ecological inline quality control system of Hammer-IMS, combining high measurement precisions with low TCO (total cost of ownership). SILAC Industrie is a large French producer of (nonwoven) felts in a range of categories: synthetic, impregnated, thermobonded, pressed, acoustic, etc. The company masters needlepunch technology to make flexible use of the broad availability of materials including natural fibers. To meet tight quality requirements and ecologic ambitions, SILAC Industrie was on the lookout for innovative measurement technologies. Hammer-IMS and SILAC Industrie have met at the INDEX nonwovens exhibition in Geneva. Both companies talked about applying the clean electromagnetic M-Ray technology on the production floor in France. One year later, the system is up and running. Synthetic felts, pressed felts, nonwoven dyed needled felts, etc. 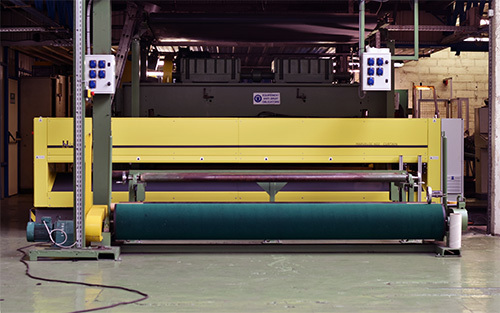 SILAC Industrie produces a range of (nonwoven) felt materials. For each material, the production manager of SILAC Industrie uploads a specific measurement configuration to the Hammer-IMS Connectivity 3.0 software, running on the machine, by means of a USB-stick. When switching the production from one material to another, the operator selects the applicable configuration (‘recipe’) by a single tap on the touch screen and the device starts measuring. this simple action speeds up the process and avoids human errors to impact the quality of the products. with the strategic choice for the M-Ray based quality control solution, SILAC Industrie took a new path to innovation.